We are entering the thick of season – parties, seasonal food, songs about holiday magic in the air. This can be a wonderful time of year! But if you’re feeling your sanity slipping away, let’s give space to our intentions. Let’s let go of tension and tiredness. Let’s breathe We are entering the thick of season – parties, seasonal food, songs about holiday magic in the air. This can be a wonderful time of year! But if you’re feeling your sanity slipping away, let’s give space to our intentions. Let’s let go of tension and tiredness. Let’s breathe. But if you’re feeling your sanity slipping away, let’s give space to our intentions. Let’s let go of tension and tiredness. Let’s breathe. – People often feel a great deal of pressure during the holidays. In my observation, the source of this pressure is usually our ‘shoulds’. These kinds of ‘shoulds’ exist in everybody’s mind; but ‘shoulds’ are disconnected from our genuine values and an authentic vision. Discovering your ‘shoulds’ and getting out from under them is complicated. Repeating the process through this meditation will take you a layer deeper, will empower your connection to your true self, and will relieve that holiday pressure. 2. Reconnect with your values. – The busyness of everyday life and the internal and external stories we carry with us muddle our connection with our values. It is essential to reconnect with what is important to you in order to keep you intentions and behaviors aligned with your values. 3. Further develop your holiday vision. – We created a vision last week, and this week we are taking it deeper. The meditation will guide you to intimately connect with and live out a satisfying holiday vision. 4. Revisit and realign your holiday money with your holiday vision. – You’re now a week further into the holiday season, and your financial picture may have shifted. Check in on your original holiday spending plan, where you are at this point, and assess if you need to adjust anything to keep you on the path to holiday satisfaction. – Getting into a time crunch puts undo stress on both our intentions and our finances. Be careful to avoid this unnecessary pressure by intentionally managing your time along with your money. 6. Relax and continue to enjoy! – If you consider the holidays to be a special time of year, settling into the pleasure of it is part of what gives you gratification. Take solace in the fact that your creating and living your intentions. Use the meditation to relax and create some space for connecting with the here and now. Breathe, and enjoy! 1. Shuff off the ‘shoulds’. – We are told what the holidays ‘should’ be like by mass marketing, by traditions, even the people around us, and all these ‘shoulds’ become stories in our heads. Releasing stories that take us away from the moment and from our true values is the first step in gaining mastery over your holiday money. 2. Connect with your values. – Understanding what is genuinely important to you is essential for good money management. Your holiday money sits inside of your greater financial picture. Getting clear about your values and how the holidays fit within them is your next step in gaining clarity on your holiday money. – Whether you’ve been wisely saving throughout the year or you plan to find your holiday money in the moment, discover the amount of money that feels balanced within your big financial picture while honoring your situation and your values as your apt amount of holiday money. * Note: Remember the incidentals (happy hours, wrapping paper, underestimating a price point), remember to add roughly 8% for sales tax (it adds up! 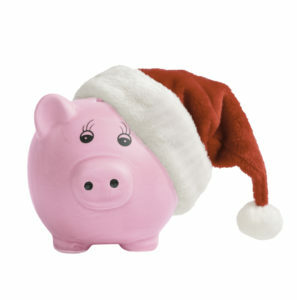 ), and plan for some whimsical miscellaneous spending – ’tis the season. 4. Connect with your holiday vision. – Understanding what is important to you this holiday season empowers you to use you money to live your values. This combined with “Shuffing off the ‘shoulds'” also empowers you to explore how you may create your vision in ways that involve less, or even no money. 5. Align your holiday money with your holiday vision. – I find using a money meditation to be particularly powerful here. It allows you to feel the balance of the many things pulling on your pocket book, and therein feel a balance of how to use your financial resources to effectively honor these. With my clients, I guide us to identifying percentages and work backwards to specific numbers. – With these steps, you’re connected with your values,your vision and your money. You’re off to a great start! Connect with the moment, and enjoy!